The one thing that makes or breaks a level for me is the ability to accurately read the vials. The easier the vials are to read in varying lighting conditions, and against different backgrounds, the better the level. 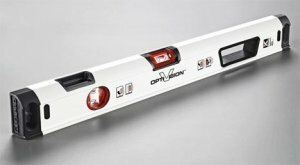 This is why the new Opti-Vision levels from Kapro look really impressive. With this level they have ditched the normal green vials and have gone with a clear liquid that somehow produces a red bubble. Kapro has taken the Opti-Vision to the next level by removing the variable of different vial backgrounds, by using their own permanent white background. This white background gives users the best viewing contrast, no matter the work conditions. The Opti-Vision vials can be found on the new 905 Condor Levels from Kapro, but unfortunately it doesn't look like they are being sold in the USA as of now. Hopefully it wont be long until these hit our store shelves.